Our range of products include cucumber seeds sorting machine. We manufacture Sorting Machines that finds wide application in the agricultural sector for the sorting of grains like rice, dal, pulses, and others. 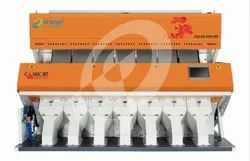 This color sorter machine is suitable for the cleaning section, or b1 section of a flour milling plant. It helps in sorting the mottled, burned, or diseased kernels, vetch and other foreign seeds to obtain spotless semolina and flour products.